You know you come from a family that loves food, when you can have a completely excited and animated conversation with your mother about baby bell peppers. That happened to me a couple of weeks ago. Jedd and I were visiting my parents when somehow baby bells were mentioned. My mother and I both squealed like school girls. “Oooh! I love those!” Mom said. “I can’t get enough of them!” I chimed in. Jedd and my father looked patient and amused, as they listed to us extol the virtues of those small little peppers. Granted, Mom and I had enjoyed a cocktail with dinner which may have made us a little giddier than usual – but baby bell peppers are extremely cool. They’re inexpensive, they come in a variety of colors and they have very few seeds to contend with. And I’ve been making us this salsa every chance I get. It takes a little longer to make than something in a blender (and by a “little” longer, I mean about half an hour) but it’s worth it. Oh, and it tastes fantastic. Also, instead of the traditional lime juice, I use lemon juice and I expand on cilantro by using parsley too. It’s equal parts sweet and spicy, which makes it the perfect condiment for blackened chicken. So, put on your favorite podcast and start chopping*. You’ll thank me after you’ve cleaned your plate. Preheat grill. Mix the olive oil and spices together and coat both sides of the chicken breasts with the mixture. Grill for 5-7 minutes per side or until a meat thermometer registers 165°F in the thickest part of the breast. Mix everything together and let it sit at room temperature to let the flavors meld. 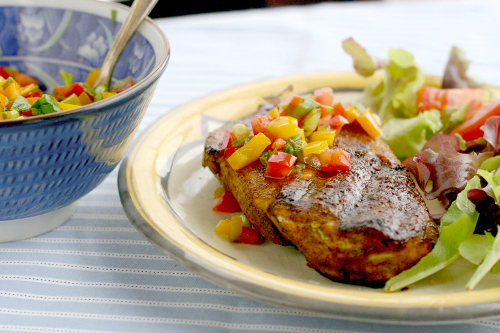 Serve the salsa with the blackened chicken and a green salad for a healthy, colorful and delicious meal. *In a sense this was really a family-inspired recipe. Mom with the peppers, Jedd who brought home chicken, and his father who gave me ceramic knives for Christmas. Ceramic knives are perfect for this kind of fine dicing. Thanks, Ev!